Torres de Serranos (or The Serranos Gate) is one of the twelve gates that formed part of the ancient city wall, the Christian Wall, of the city of Valencia. 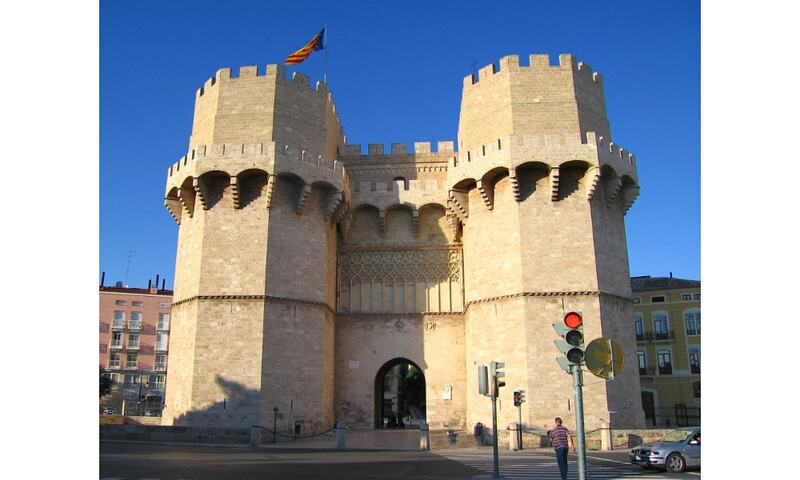 It is an important landmark and one of the best preserved monuments of Valencia. Of the ancient city wall, which was pulled down in 1865 on the orders of the provincial governor Cirilio Amoros, only the Serranos Towers, the 15th century Cuart Towers, and some other archaeological remains and ruins have survived. The Torres de Serranos were built in the 14th century by Pere Balaguer. It was the main entrance of the city and it was originally build with a defensive function. From 1586 until 1887 the towers were used as a prison for nobles.